Acklam Car Centre sells over a thousand quality and affordable used cars every year, with focus on excellent customer service and on sourcing 4x4s, performance cars and prestige vehicles. 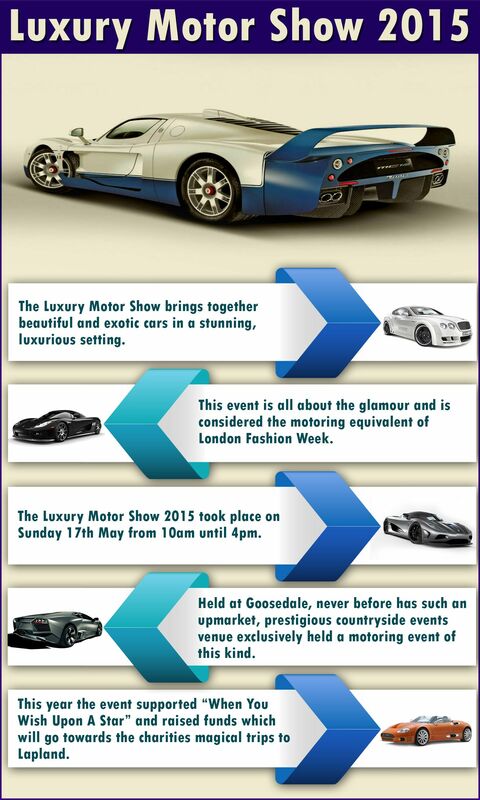 The Luxury Motor Show brings together the very best of these vehicles every year at the luxurious and upmarket Goosedale venue. The motoring world’s equivalent of London Fashion Week, the Luxury Motor Show is one of the most prestigious events on the motoring calendar, showcasing beautiful, exciting and exotic cars in an exclusive countryside location. Funds raised at this year’s event, which took place from 10am until 4pm on Sunday May 17th, supported the magical Lapland trip of the children’s charity “When You Wish Upon A Star”, taking a hundred children along with parents and carers to visit the real Santa Claus. For those thinking about attending next year’s event, Acklam Car Centre offers this overview of what to expect. The Luxury Motor Show takes place in spring each year in the grounds of the beautiful Goosedale in Nottinghamshire and is by far the most prestigious car event in the region. The event is set in one hundred acres of verdant English countryside overlooking a thirty acre private lake, with surroundings paralleling the class and sophistication of the vehicles. Visitors are able to witness some of the rarest and most luxurious classic and modern supercars from specialist manufacturers and industry giants including Bentley, Ferrari, Rolls Royce, Lamborghini and Aston Martin. The 2014 event alone attracted some 3,500 visitors and raised £10,250 for charity through showcasing and celebrating all things automotive. Headline sponsor in 2015 was Bentley Leicester. Bentley Motors was first established in 1919 and almost a century later can be classed as the definitive British luxury car company. Owned by Volkswagen since 1998, Bentley Motors creates highly desirable high performance, luxury grand tourers. At this year’s Luxury Motor Show Bentley Leicester were pleased to announce the addition of the Lamborghini brand to the existing site. As a highly prestigious luxury event the show attracts sponsors across a wide range of industries. Gold sponsor this year was pension consultancy and wealth management services provider Mattioli Woods. There were a further six Silver sponsors – Savills (real estate), RSViP (premier business networking), Impression (digital marketing), Hamilton Grays (luxury and supercar specialist sales and marketing), Nick Singh (custom-made gentleman’s clothing) and Lumbers (fine jewellers), plus additional sponsorship from San Miguel and Tattinger Champagne. The Luxury Motor Show supports the UK children’s charity “When You Wish Upon A Star”, a non-profit organisation that grants wishes for children suffering from life-threatening illnesses. The charity offers children a chance to have one of their wishes come true, be that a trip to Disneyland, a new computer or an opportunity to get up close to their favourite celebrity. The funds raised by the Luxury Motor Show each year support the annual trip to Lapland, providing children with the chance to meet the real Santa Claus on the trip of a lifetime on the chartered Santa Express flight. The Luxury Motor Show features marquees from some of the biggest names in luxury and supercar production in the world as well as showcasing specialist boutique manufacturers. If you own a prestigious, high-performance or unique vehicle or you are thinking about purchasing one from, you can apply to display your vehicle at the 2016 event. Success of applications is dependent not only on vehicle type but also on the number of similar applications as the event tries to showcase as wide a variety of manufacturers and models as possible, operating on a first-come, first-served basis. Tickets for next year’s event are not yet on sale but when they are they can be purchased through the Luxury Motor Show website or through Ticketweb. In 2015, tickets on the gate were priced at £18 for adults, £9 for children aged between 5-15 and £55 for a family ticket (2 adults and 3 children, with under-5’s going free. Dogs are admitted but must be kept on a lead at all times and are not allowed in any of the indoor areas. If you love luxury cars and want to get involved, keep an eye out for advance ticket sales early next year or apply to showcase your car online. If you are thinking about purchasing a quality used prestige or performance vehicle in the coming year, check out the stock listings for makes such as Ferrari, Aston Martin, Alfa Romeo, McLaren, Bentley and more on the Acklam Car Centre website, where quality and affordability combine with the best customer service around. This entry was posted in Blog, Uncategorized and tagged exotic cars, Luxury Motor Show on July 17, 2015 by admin.